Details are everything! Don’t you agree? I believe accessories really adds a stylish touch. Lately, my favorite fashion pieces are wooden accessories. Today on Reeshespieces, I am collaborating with a very popular unisex wood watch brand that is timeless… JORD (pronounced: Yode) WATCHES. Jord Watches is based in St. Louis, where they create a sophisticated mix of natural and renewed materials, combined with quality designs and components. I admire the black packaging which holds a presentable Cedar humidor Jord box that encases your very own Jord Watch. Along with a mini drawer component that holds additional links and care items that will keep your timepiece lasting a life-time. Most watch backplates can be engraved! Cedar humidor presentation boxes are engravable as well. The watches are sized for the recipient. You are able to customize your watch by mixing and matching different faces or woods! I love the variety of styles in the Jord collection! So many unique styles to choose from, for any occasion and any outfit. These wood watch stands out in quality and craftmanship. This particular watch caught my eye in style and detail! 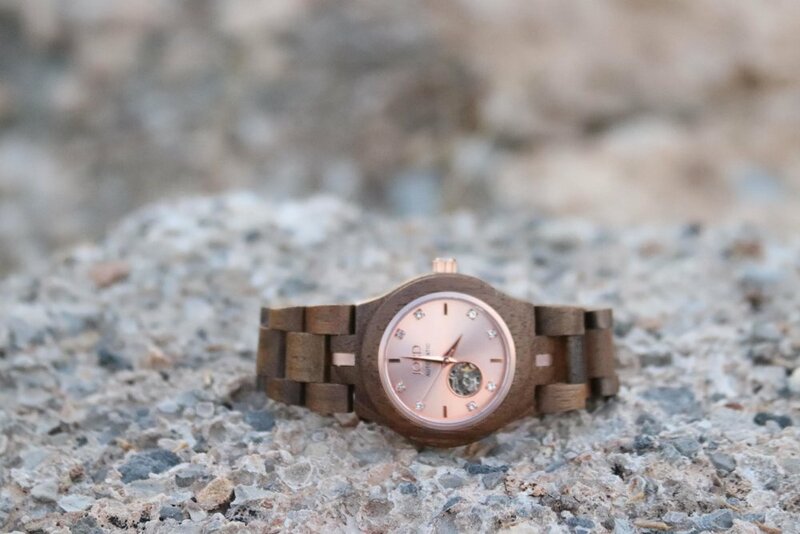 I’m not a big fan of silver or gold but do appreciate that Jord creates rose-gold wood watches! I love the color and quality of the Koa wood, it matches beautifully with the rose-gold face & dial along with the unique transparent back-face. This is one of my favorite pieces that will go great with day to day attire. The winner will receive a $100 gift code toward the purchase of any watch in the Jord Collection! All other participants will be emailed a consolation 10% off gift code. *All opinions are my own ©Reeshespieces.